Privacy: This is not a Secure Site with Passwords and Such. When you submit a Story or Pictures, or reply to a Post, I will review it before I approve and publish. I will never publish your contact info or share with anyone without your permission. …I Promise ! Hello… I’m Gary. That is a pretty old picture of me in full marketing mode, dating back to my last Real Estate Website. I had great fun with Residential and Investment Real Estate for 35 or so years. I still hold a California Real Estate Brokers License, but thats too far to go to show a house. One of my 2001 deals landed me a very old house in a very sweet location in Florence. In 2009 the Real Estate market continued its meltdown, and I decided it would be a great time to go to Oregon. Before and during all of the above, I worked 26 cumulative years at Lockheed Martin Corp. in Sunnyvale CA. as a Technical Illustrator, Graphic Artist, and Art Director …all in the corner called “Technical Publications”. It was all NASA and Military stuff. During the last few years of my stay at Lockheed, I had a small staff, tasked with inventing “Interactive Digital Media”, that later became known as “Multimedia”. I loved interface design, and playing on the edge. I was working overtime creating cool interactive products for “Technical Training” and “Executive Presentations”, all delivered on an actual CD ROM. Before long, “The Internet” began to change the way things were done. At the same time I was busy selling houses to rocket scientists in Fremont CA. So once again, I turned in my badge and went back to Real Estate. — Pioneers are the ones with arrows in their back. I have been building Hot Rods my whole life… mostly. I am currently running one of my oldest projects, from 1985, a ’74 Chevy Vega Wagon. Its a 350 Chevy, with a 5-Speed, narrowed 12 bolt posi rear end. Lots of upgrades in suspension, brakes and such. More about that HERE. 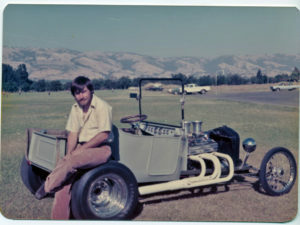 Here is a 23 Ford T-Bucket I built from nothing… Sure wish I had it back. I also built a V8 Austin Healy Sprite, a wicked ’64 Dodge Dart, and a dozen more I don’t think I even have pictures of. My favorite part is building and driving more than showing. I love seeing and studying what others have built, and how. Thanks for visiting Oregon Coast Hot Rods. I want to start by thanking you for this websight. As a Rhody Cruiser, your websight will be an invaluable tool for getting the word out and sharing experiances. Thank you. Thanks for setting up this web site nice job we enjoy it a lot! Thanks for the site Gary. I have been a Rhody Cruiser from the inception of the organization. Spending many years in the Florence area (now in Eugene) it’s really nice to see the club has grown to what it is today. I worked at the local radio station there (89-01) and was part of and helped organize several Rhody cruises. When the club started we had under maybe 20 members..really, mostly just us locals and at the time I was without a ride? I sold most of my toys as I had a big family to support. I make it back a couple times a year, and will be there in Sept. 2015 with the Rhody Cruisers Jacket on displaying the clubs logo. Thanx Lonny… Look me up at the show I’m running a ’74 Vega. I would Love to chat with you…. Tim and Pat will be there too.. Are you showing? LOOKING FORWARD…. Gary, It was fun meeting you yesterday in Coquille, and, talking about the old days in Fremont, Ca. Your web site is great, didn’t know it was there, had fun looking at all you put in it. You put an obvious great effort into it. Will be checking it out alot now that I know its there. Please commuicate to Rhody Cruisers that Eric Baldwin, member, passed away peacefully in his home in Greentrees the morning of October 13, 2016. Of cancer. His wife Linda Linhorst and long time friend Anne Clark had awonderful dinner with him the previous evening at the casino in Florence. He is survived by son Mike of Santa Maria CA and a maternal neice Erin Baldwin of Eugene , neohew John of Coos Bay and grandchild first grader Deegan on Tigard, contact Anne Clark for further details 541-961-4070. Funeral arrangements pendind Burns Riverside Chapel, Florence. Its Mike from England and just to give you my new details in case you have any photos etc. I lost all my contacts when I left my last employment however found one of your hot rod cards this morning. Hope your all ok. It was good to meet you when we were over visiting Waldport. Here are my new details below. Hi, my name is Leslie and I’m part of a classic car group out of Reno (‘Round Nevada) that makes a yearly 2,000 mile road trip. This year we’re coming through Florence on Friday, June 8th – Sunday, June 10th (staying at the Quality Inn). We’re expecting between 25-30 cars to be joining us this year and I’m looking for things our group would enjoy experiencing in your community as well as hoping to connect with a local club. Would your club have any interest in getting together for a Meet & Greet? It could be as simple as directing us to a restaurant parking lot where we could all enjoy one anothers’ cars and then having the restaurant handy when our stomachs start to growl (which happens often!). 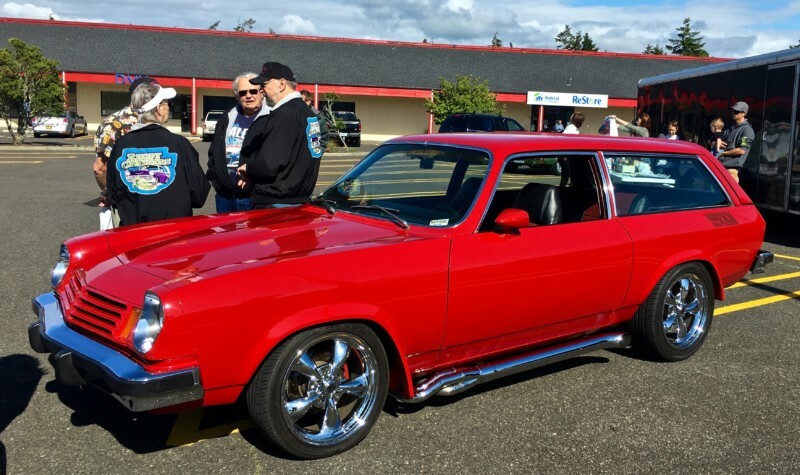 We’re a laid-back group, with a collection of cars from the ‘30’s to the ‘60’s, some stock, some modified…just a group of folks that love classic cars in all forms. Let me know if getting together might work.